Angels hurler Jered Weaver threw MLB’s second no-hitter of the season, striking out nine and walking one in a 9-0 win over the Twins. “Why couldn’t you be perfect?” screamed Weaver’s mother, who was actually Weaver himself wearing a wig and staring in a mirror. “You’re nothing! 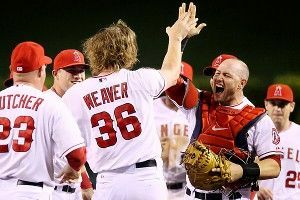 You’ll always be nothing!” Man, Jered Weaver is complicated. Marian Goborik scored in the third overtime to give the Rangers a 2-1 sudden death win over the Capitals and a 2-1 series lead. Hey, anyone else up for calling him “Ranger ‘Rik”? You know, from the kid’s nature magazine? With the conservation and the birds and- ah FORGET IT YOU GUYS ARE LAME. Predators goalie Pekka Rinne came up with 32 saves to shut out the Coyotes in a 2-0 win. As the tension builds and the series winds to a conclusion, the cities of Phoenix and Nashville are considering the addition of 10,000 riot police to their downtown areas, and rumors are spreading in Washington that Barack Obama may impose martial law as a precaution. Chipper Jones hit a walk-off two-run homer to end a wild 15-13 Braves win over the Phillies. “I feel like I’m 40 years old again!” yelled an ecstatic Jones from the ice baths. Sources report that Stanford Athletic Director Bob Bowlsby will accept an offer to become the next commissioner of the Big 12. In light of this news, let me be the first to congratulate the Big 12 on their impending success in sports like roller blading and rafting, and let me also offer to ghost write the novel about how they used to have good football teams. Barcelona’s Lionel Messi notched a hat trick in a win over Malaga to set the all-time European club scoring record with 68 goals on the season. The previous record-holder, German striker Gerd Mueller, still holds the record for most goals in a season without smiling. I’m putting the call out for Reader’s Revenge, the feature where we take stories from you, the reader, and feature the best ones in a top ten list. This week’s topic is Your Worst Moment with the In-Laws/Significant Other’s Family. Click the link to see the last installment and get more info if you have no idea what I’m going on about, and otherwise send your best stories to tobaccordblues@gmail.com by Sunday. As of today, this topic is wide open. What's Going On With Matt Kemp?